Coming up we’ll hear an interview with Money Metals president Stefan Gleason, who was a featured guest during the recent 360 Gold Summit. 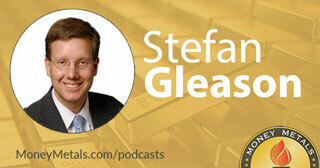 Stefan addressed the fundamental question of “why precious metals” and also gave some helpful tips on how to avoid making big mistakes when investing in gold and silver. Don’t miss this fundamentally important and enlightening conversation coming up after this week’s market update. Gold and silver markets pulled back this week, as the Dow Jones Industrial Average rose to hit a new milestone. On Wednesday, the Dow closed above 20,000 for the first time ever. U.S. stocks have been in a major bull market since the 2009 bottom. Those who bought near those lows and held on for the ride have certainly been rewarded. But buying stocks back when they were out of favor wasn’t easy. You had to be a contrarian, and you had to have the wherewithal to not get shaken out as the stock market climbed the proverbial wall of worry. What is the Volatility Index? Fast forward to 2017, and we’ve gone from maximum fear to maximum complacency – or something close to it. Just take a look at the latest readings on the VIX volatility index. The VIX is also known as the fear index, because it options pricing data to measure how much investors are willing to pay for upside potential or downside protection. As the Dow hit 20,000 this week, the VIX fell to its lowest level since 2014 and second lowest since 2007. The low in the fear index in 2007 came early in the year. The peak in the stock market came a few months later that year. So while the VIX may not be a precise market timing tool, it can flash early warning signs of excessive complacency. It’s too early to tell whether the next sell off in stocks will represent the start of a major bear market. Bull markets typically end when major divergences start showing up in advance/decline ratios, momentum gauges, and underlying fundamentals. One divergence we’ll be keeping an eye on is the Dow to gold ratio. Even though the Dow made a new nominal high this week, it didn’t exceed the high it made back in December in terms of gold. That high was a bull market high vis-à-vis the 2009 bottom in stocks, but it wasn’t an all-time high. Not even close. From 1980 to 2000, the Dow to gold ratio moved from as low as 1 to 1 to as high as 43 to 1. Since 2000, it has fallen to as low 6 to 1. The Dow to gold ratio now stands at around 17 to 1. Should it ultimately revisit the 1:1 ratio, we’d be looking at a massive stock market crash, an explosive move higher in precious metals prices, or some combination of both. Could gold prices one day meet the Dow at 20,000? It’s an extreme scenario, to be sure, but it’s not as farfetched as Wall Street would have you think. There is historical precedent for a 1 to 1 ratio. Yet the financial services industry and the financial media can’t see it happening again because they are institutionally biased against precious metals. They prefer to laugh at or ridicule gold bugs rather than consider their arguments and the possibility that they might just be right. President Donald Trump faced scorn and snickering from the biased media throughout his campaign… until finally, HE got the last laugh. But back in 2015 when Republican primary campaigning began, the mainstream media didn’t even pretend to take seriously the possibility that Donald Trump could be the next president of the United States. Lawrence O’Donnell (flashback): I have not yet included Donald Trump in our coverage of the Republican presidential campaign this season, and that is because he is obviously never going to be president. He is obviously never going to be the Republican nominee for president, and he is obviously never going to be a candidate for president. Political Commentator (flashback): He will not be president. He will not be the nominee. He'll go through a few primaries, I think. Political Commentator (flashback): This man has got some momentum and we better be ready for the fact that he might be leading the Republican ticket. George Stephanopoulos (flashback): I know you don't believe that but I want to go on (others laughing). News Anchor (present day): What once might have seemed like a joke is suddenly no laughing matter. As an investor, you need to prepared for times when markets defy the odds and the analyst predictions and move in the opposite direction that most people expect. Remember all the warnings from all those highly respected voices on Wall Street and in the pages of the New York Times who told us that electing Donald Trump would be disastrous for the stock market? Well, right now stocks are riding high on a lot of high expectations, with few investors seeing the need to hedge themselves against downside risk. Precious metals markets, meanwhile, are largely being overlooked and under-owned by investors. Despite gold prices rallying in the first three weeks of the year, the latest holdings report from the GLD gold ETF shows investor buying of shares at the lowest level since March of last year. These are the sorts of depressed sentiment conditions that often coincide with bargain prices and great buying opportunities. Gold prices currently come in at $1,188 an ounce after declining 2.0% this week. Silver is down slightly less or 1.3% since last Friday’s close to trade at $16.96 per ounce. Getting hit the hardest this week is palladium, which now shows a weekly loss of 6.9% to come in at $737. Prior to this week palladium was up a whopping $130 over the previous four weeks so it was certainly due for a pullback. And finally, platinum is off 0.6% to trade at $976 an ounce as of this Friday morning recording. Stefan Gleason: Well, first of all, if you have made the decision not to buy proof, rare, or commemorative coins, unless you are a true collector and an expert and have the time to learn. You’ve made the best decision that you can make. The following decision on exactly what the denomination, weight, or size is somewhat inconsequential in comparison. But, obviously, there are different products, there are different choices. One ounce is the most popular size generally of both gold and silver. I think that is probably a good place to start. If you are looking at gold and silver as emergency or crisis type hedge, which is part of the reason I own it, and you might even worry about the potential for having to use gold and silver as a currency or as in barter or so forth. Well, in that situation, you want to have some fractional gold and particularly silver, which is a nice, small increment way of owning it. It’s a little higher in premium. Not much higher, but it is higher. You do not necessarily want to put all your money into small fractional in half ounce, quarter ounce, tenth ounce, type stuff. But it’s nice to own some of that. I would say that 1 ounce is probably the best place to start. Then to get a little bit of fractional silver bullion on top of that. From there, we can talk about coins and bars. Mike Gleason: You’ve just heard the first half of Stefan’s interview with Pete Fetig during the recent 360 Gold Summit, I hope you enjoyed it.